Ellie is struggling to adjust to her new life after her parent’s deaths. The young girl is adrift, searching for something to give her life meaning. She finds that meaning in a young man, a drifter in need of help. Vincent is lost. Cursed and haunted by his actions, he drifts through life. If he can find something, even a lie, to cling to, perhaps he can put himself back together. Perhaps he can tame the beast inside of him. Two paths cross and two lives are forever changed. 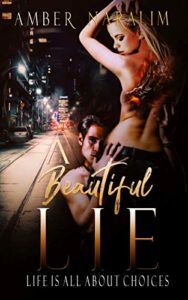 A Beautiful Lie is a prequel to Naralim’s fantastic Walking with Monsters, showing how Ellie met Vincent and how the tragedy that befell her family and catapulted her into a life of danger, the life of a fugitive. It’s a fascinating look at the characters before the darkness claimed them. Before Ellie walked with a monster and left the light behind. Naralim is an indie author who writes powerful stories full of dark and engaging themes. Any fan of urban fantasy, dark romance, and fairy tales needs to check out her series! You will not be disappointed! You can buy A Beautiful Lie from Amazon.